I wrote this post as I have been collecting questions that are typically asked at a resident medical officer (RMO) interview. So this top 14 is based upon what job candidates are reporting are the common types of interview questions being asked by hospitals in Australia for resident medical officer jobs or what are sometimes referred to as junior house officer or hospital medical officer jobs in Australia. at least one clinical scenario where the focus will invariably be on recognising a sick or unwell patient and asking for help early. So typically these jobs are at a postgraduate year 2 level. Hospitals often post these openings throughout the year in an attempt to fill gaps in their trainee doctor rosters. So these jobs offer opportunity for Australia doctors to move hospitals but also provide opportunities to get their first job experience in Australia. I am posting this information as it may help both local as well as international medical graduates who are fortunate enough to be offered an interview for resident medical officer level job. Question 1. Tell us about your experience and how it makes you a suitable candidate? I've written in another post about how this question is often just asked in the shortened version. “Tell us about your experience.” In which case its a very lazy question. Its often asked because sadly on some resident medical officer interview panels the panellists are slotted in the day before and do not have time to review your application and CV. Regardless of how the question is asked you should answer it by telling the panel about how your experience makes you a good candidate. Do this by picking out one, two or three of the selection criteria and relating your experience to them. So, for example, a common selection criteria is around communication skills. So talk about how your recent experience has been working in a hospital with lots of patients who are from a Non-English speaking background and how you have had to collaborate (probably another selection criteria) with other members of the team to meet this challenge. I recommend that you take a portfolio of relevant files to the interview. One of which should be a print out of the selection criteria. What To Take To Your Interview. Question 2. What are your long term career goals and why this hospital? This is the other common opening question. If you have written a Career Goal Statement that is tailored to the job description then you pretty much have the basis of the answer of this question. This question is digging into whether you have done your appropriate research. Have you identified a reason why the hospital will help you in your career? For example, does it have good exam pass rates. Or is there a particular subspecialty that is not available elsewhere? Whatever the case you should be able to identify something of value in the position that will help you. Make sure that you are emphasising that its a positive factor about the health service or hospital. Interview panels want to hear nice praise about their institution. But also make sure that you quickly bring it back from your personal needs to what you can give to the hospital. This should be something or somethings reasonably unique to you and not what other candidates might also choose to talk about. Se below for strengths and weaknesses. Question 3. A member of the nursing staff complains that an intern is not attending calls and not doing duties properly, what will you do? A big tip for this question is to avoid the inclination to stereotype nursing staff and refer to the nurse in this scenario as female. Hypothetical scenarios are common in doctor interviews. This one bundles both the potential for work conflict (between yourself and the nurse, yourself and your colleague and the nurse and your colleague) along with topical matter of trainee doctor well being and what's called the trainee in difficulty. So the key here is to cover all the key principles in the scenario. To show you have broad awareness of what might be going on. Another very good tip for this question as well as most other questions is to list your key points first. That way the panel knows what you are thinking, even if you run out of time to address all the issues. How you engage in the initial discussion with the member of nursing staff in a respectful and listening manner. What your strategy for approaching your colleague is. And again, how you are going to conduct that initial conversation, which is often referred to as a “quiet chat”. The potential outcomes of your “investigation” into the problem. In particular, how you would handle it if your colleague was resistant and how you would handle it if they confided in you a problem. Your responsibility to discuss things with more senior colleagues. Question 4. Describe an error you made in your practice and what you did to fix it? This is an example of what is called a Past Behavioural Question. Panels like to ask for examples of past work that fit the current job challenges as demonstrating what you do is far more powerful and predictive than saying what you would do. You should definitely have an example of an error ready to give. As well as one about work conflict (see below). The key here is to be able to give an example of an error that was significant but for which there was not a really terrible outcome. The best examples are of system errors or simple communication errors. If possible it should be something where you caught the error yourself and then there was an attempt to look at the system to improve it for next time. So for example an error where the wrong data was entered on a discharge summary because the electronic record system was unclear would be a good one. So long as the patient was okay in the end. Answer all example type questions using the STAR method. Please. Please. Please don't forget to give the panel the result of the example. So many times job candidates tell the story but then fail to sell it by going over the results of their actions. If you don't talk about the results of your actions the panel will assume you are not results oriented and probably also take feedback poorly. Not good. Question 5. What strengths do you bring to this role? This is sometimes answered alongside a request for weaknesses (see also below). If also asked for weaknesses. Start with weaknesses first and give just one. Then end with two or three strengths. For strengths. Try to come up with something reasonably unique and remember it needs to be relevant to the role. Because pretty much everyone does say that about themselves at these interviews. It doesn't have to be overly specific. Just something which you can back up. So for example if you have done a lot of teaching in your career and have good feedback on this. This would a a good strength to highlight in terms of any teaching responsibilities of the role. There are always at least some medical students floating around that need looking after. Question 6. A nurse is insisting to give medication to a patient whom you don't know and you don’t know the medication. What do you do? Some questions seem simple on the surface. But providing a simple answer is not going to get you very far. Its obvious with this hypothetical question that you should of course not go ahead an prescribe the medication. But you need to show your awareness of the needs of others in this situation, in particular the member of nursing staff and the patient. How are you going to discuss your dilemma with the nurse and possible the patient? Is the situation urgent? Will you need to call your senior for advice? Do you have time to go away and look up the medication and review the patient's file? What will you be telling the nurse? Their job is probably being held up by your current lack of knowledge. So you should be indicating to them when you will be able to get back to them. For hypothetical scenarios the CanMEDS Framework from the RCPSC is a great model. It gives you lots of ideas about what sorts of issues to cover. Its also the framework upon which every Australian medical specialty college has built their frameworks upon. Question 7. Describe a situation where you displayed leadership skills. Again. We are looking for an example here. So using the STAR method is recommended. Its sometimes difficult as a trainee doctor to find opportunities to demonstrate successful leadership. So don't forget “followership”. This is where you act as the first person to follow a leader and help them to enact a change. Good examples are things like noticing a safety or quality problem on the ward and instigating a change. For example, perhaps a ward trolley was inadequately stocked and you worked to improve the situation. Be prepared however to demonstrate evidence of lasting change. Did you go back and check that ward trolley after you left that rotation? Question 8. What is the importance of documentation as a doctor? This question tests your awareness of some of the key requirements of the role of trainee doctors. Particularly the most junior trainee doctors, where documenting (or dealing with computer information systems) can be 80% of the job on a daily basis! Obviously documenting IS important. But Why? Again, the CanMEDS framework may be a helpful construct for you in this question. You might also legitimately answer this question by saying: “Documentation as a doctor is tremendously important and I am going to give you 3 examples of why?” Then give three good examples. There's so many angles to this question that giving 3 good examples is going to be just as good as covering every point that you could imagine. Question 9. Describe a situation where there was conflict between yourself and another member of a team? This question is a big but avoidable trap. You can avoid it by being prepared for it and having an example. Again. The STAR method is your friend and the key here is to be able to demonstrate that you managed the conflict to a point where you were at least able to have a good ongoing working relationship with your colleague. Its important to not only describe the situation and the conflict. But also take the panel through the steps you took in terms of your communication and collaboration to work with your colleague on the conflict and how you showed respect to them. Question 10. You are covering the obstetrics and gynaecology wards one evening and a 35 year old female patient who had a caesarian section 2 days ago is now presenting with severe shortness of breath and chest pain. What is your approach? You can insert here any typical clinical scenario which might happen on the ward where the resident medical officer is called to review. Chest pain and other types of escalating pain are favourite scenarios. Usually the scenario is in two parts. The initial question which is in the form of the information you might be given when a member of nursing staff calls you. The next bit is the examination findings. Generally the examination findings are either of a patient who is deteriorating or already in need of an emergency response. You would prioritise the call – Go Straight Away. You would ask for vital signs over the phone. You would ask the nurse to call an emergency response. If the vitals warranted it. You would ask the nurse to stay with you to help. You would have in the back of your mind a question about “What could be the worst case scenario here?” for example a pulmonary embolus. You would take a quick history and examine the patient. You would have a low threshold for calling a senior colleague and/or an emergency response. Question 11. Describe a situation where you displayed effective communication skills? This is similar to the conflict question above. And in fact. It is perfectly okay to use the same example to answer more than one question. Other typical situations to think about for this question, include complex patients and / or patients and families with communication challenges and / or patients and families who are upset with their care. Question 12. What qualities should a resident medical officer posses? Which ones do you have and which ones do you lack? This is basically a variation of the strengths and weaknesses question. But there is also a big hint stating you in the face. The position description, in particular the role statement and the selection criteria. So you can use these to your advantage. This shows you have done your research and you are willing to align your opinions with the panels views of what a good resident medical officer is. You can then go on to highlight the sort of qualities that an individual might need to meet these criteria and match them to your own. So for example. Ability to work under pressure is often a selection criteria. So you could talk about this requires a quality of being calm in a crisis and being able to juggle a number of tasks. How To Talk About Your Weaknesses. Basically you should not choose to talk about something that is a big weakness that you have chosen to do nothing about. Ideally you should pick something that you have identified that you are not so strong and have been working on. For example, maybe you struggle with reading. And you know that this is important for the exams. So you have joined a study group where other members are better readers and you are challenging yourself and keeping yourself accountable that way. Question 13. Describe a situation where you displayed teamwork. Again. We are starting to repeat ourselves with this question and questions about communication, conflict and leadership. Great examples here are situations where you noticed your colleague was struggling. Perhaps they had a bigger caseload than you. And you stepped in. Others might include helping to onboard a new doctor to the team. Question 14. You are called by nursing staff and are told that some antibiotics were given to a patient that were actually supposed to be given for another patient, what do you do? 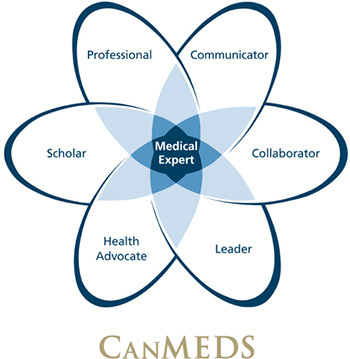 Once again the CanMEDS Framework will be helpful here. Lets look at it in more detail. So. Obviously your first concern is for the safety of the patient who was given the wrong antibiotics. Are the allergic? Do they need monitoring. Also, has anyone else been given wrong medications and needs to be checked? After this there is the issue of disclosing to patients and their families what has happened. You are representing the hospital so you need to be able to talk about how you would carry this function out. You need to do the initial disclosure but then be aware that more senior staff should be informed and take it from there. So. There is how you communicate with the patients and families about what has happened. There's also communication with your nursing colleague and there is communicating with seniors. You are needing to work collaboratively with the nursing team to identify all the current risks and deal with them. You also need to be mindful of keeping good relationships with nursing staff. The nurse may be in trouble for what has happened OR possibly they were doing the right thing and a doctor has made an error. There will be hospital policies and protocols that need to be followed. You may not be aware of all of these but its your responsibility to find out about them. The incident will need to be reported and you should be making careful notes of your involvement in case there is an investigation. Potentially in this scenario there has been a breach of professional standards. But that's not immediately evident. Is this the only time this problem has occurred? Was it predictable in hindsight? Does there need to be some thought to changes that would prevent it happening next time or an audit of processes. You noticed I didn't even mention medical expert in all of this. Question 15. Describe a situation where your consultant noticed that you have made a mistake and how did you react? This one may be hard for international medical graduates to answer if they have not had any medical work experience for a while. If so, panels will usually accept a suitable example from another job. This question is a variation of the error question. So again. The idea here is to not produce an example of something where it all went terribly wrong. If you think about it there are probably lots of times where your senior colleagues have pointed things out to you that have helped you improve. We learn a lot from mistakes. And this should be part of your answer. An ideal answer would include how you encouraged your consultant to give you specific feedback about your mistake so you could improve for next time. Bearing in mind that most doctors are terrible at giving feedback to other doctors. And then how you measured your success. Question 16. You are the Resident in Emergency and a patient suddenly collapses. What do you do? Basically another clinical scenario where you are the first responder. You should not forget that even though you are in the Emergency Department you need to call an emergency so that others respond. Once you start getting into going through the DRABCs. There will probably be some supplementary information provided about the patient. Along the lines of them being in shock. Again. Call for help whilst dealing with this situation. Bear in mind that its a rule that doctors in prevocational roles should not be the only doctor in the Emergency Department so there should be someone more senior to call upon. Question: Should I Ask A Question At The End? Answer. In most cases you have probably already had a chance to ask questions before the interview. So its perfectly fined to say no. But remember that the final question at the end is a chance for you to go back and review some of your answers or clarify anything you feel you may have gotten wrong in the interivew. If you are after a good sort of question to ask. Think about asking for some feedback on how your interview went. Whilst the panel obviously can't tell you whether you were successful or not. They may have a useful insight for you. And this may be your only opportunity to get meaningful feedback. You might also consider asking the panel what they feel that their biggest challenge is at the moment. Only do this however if you think you might be able to offer some assistance in meeting this challenge.